A bunch of country colour, fresh and vibrant! 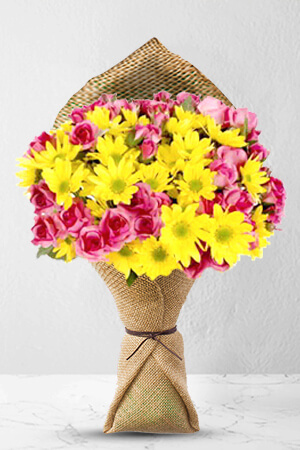 Beautiful Spray Roses and Chrysanthemums make up this bouquet that will fill any room with gorgeous colour.The vase pictured is not included however; to better personalise your gift, we recommend you send a Premium Vase with your order. Easy and excellent product, great service. Thank you so much. The Cottage Blooms flowers I ordered for my mother's 90th birthday in N.Z. arrived on time and in her own words are "absolutely beautiful". It meant the world to me as I live overseas and wanted my Mother to receive something extra special on her special day. everything was perfect and I was told the flowers are the best they have ever seen. Excellent service, I'm very pleased. Scheduled as planned and beautiful flowers!